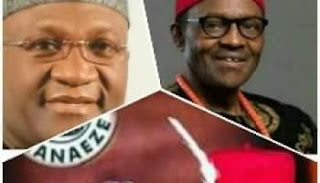 EXPOSED AND PLEASE SHAREWIDE: Information collated from a reputable and reliable medium but won't be mentioned based on security reasons, has it that The president of Ohaneze Ndigbo, Nnia Nwodo and his counterparts Dr Ezichi Chukwu & Co have been given 65k dollars each by the federal government to declare Nnamdi kanu wanted Next Week and this will in turn lead to Nnamdi kanu's bail bond signatories being dragged to court. This carefully orchestrated move is in a desperate bid to divert the attention of Nigerians and the international communities at large from the obvious fact that the Nigerian Army abducted Nnamdi Kanu from his home on the 14th of September and have kept him in oblivion till date. Also, The same Nigerian Army are reportedly planning to revisit Nnamdi kanu's house on or before saturday.We are the masses and we must win this battle come rain come high water. Ipob..... One family...... Anagwo ona ere.Nnia Nwodo and counterparts arrived Abuja on presidential private jet for. They have already met with chief security adviser and will meet the president tomorrow.